“A BREATH of fresh air, a change for you”, and a remarkable new jazz release featuring an extraordinary breadth of experience, musicianship and creativity. 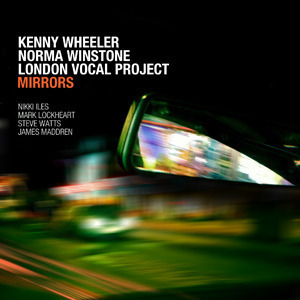 ‘Mirrors’ brings together the legendary Kenny Wheeler (flugelhorn) and Norma Winstone (vocals) in an exceptional collaboration with the 25-strong London Vocal Project directed by Pete Churchill, the brilliant Mark Lockheart (saxes), and the quite superb rhythm section of Nikki Iles (piano), Steve Watts (bass) and James Maddren (drums). This original suite of beautiful music by Wheeler is built around texts from Lewis Carroll, Stevie Smith and W B Yeats, creating what feels like a unique palette of vocal and instrumental colour. Originally a commission for five solo voices, it has evolved into something far more expansive, and is very special indeed. The poetry heard can be curious, intriguing, melancholy, and even perplexing! But, above all, this is a joyous recording, and one which soon encourages the listener to participate in the words, melodies and the whole fascinating experience (I certainly have done!). This has to be due to the empathy these accomplished musicians have – it’s tangible. And if one applies a ‘player cam’ observation to any of the artists here, it is both rewarding and breathtaking! The LVP’s singing is glorious, and wonderfully attentive. This is a huge and challenging project for combined voices, and the range of moods and expression these young singers create is so impressive. Sometimes whisperingly smooth, on other occasions bright and jaunty, their clear sound might be described as ‘retro’ (perhaps reminiscent of Sixties vocal jazz) – but it is much more than that. Taking the marvellous Breughel as just one example – the chord sequences of the opening three stanzas are spine-tinglingly luscious, yet their immediate choral restatement enhances this still further, far from the ‘meaningless sound’ of which they sing. Priceless! The instantly-recognisable depth and expression of Norma Winstone’s voice compels us, as always, to hang on every word. The buoyant Breughel already mentioned; the downbeat mood of The Lover Mourns and The Bereaved Swan; the whimsical, playful The Hat; the marvellously ‘swung’ vocal of Tweedledum – all delivered with compelling authority and assurance. Combined with Kenny Wheeler’s characteristic flugel mellowness and reaching runs, this is stimulating contemporary jazz which demands both attention and exploration. Mark Lockheart’s playing is warm, assured and always appealing, offering some great interspersed tenor lines on the lively, opening Humpty Dumpty and later on with The Deathly Child. Soprano on The Broken Heart gives the ‘withered roses’ tale an appropriate, even mocking, edge. Black March is an instant, firm favourite with its bright lyric, an irresistible groove from Iles, Watts and Maddren, and infectious vocals from LVP. Here, and throughout this whole album, Nikki Iles’ playing is outstanding, showcasing her many pianistic attributes – the lightness of touch, dexterity and inventiveness are a joy to hear (with excellently engineered piano sound), frequently raising a smile with this reviewer! A significant release from Edition Records which, in terms of personnel, performance and production, they have achieved magnificently… and one which I cannot recommend highly enough.